Part 1 – Free Motion Machine Quilted Bags! I’ve made lots of bags decorated with machine quilting (actually, I only make bags to show off the fabric embellished with my free machine quilting!). I started making machine quilted bags many years ago when I started teaching – they were a fun and practical way to show off my passion. Here are some of my first bags. I love th e rounded shape and the shoulder strap ties. I taught a workshop to make this bag, but the workshop was two days long – with *homework required* in between the two days. I decided I needed a simpler bag. 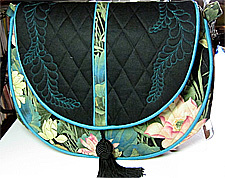 Later, I needed a special occasion bag for myself, and made this bag out of silk sateen. I designed the bag to be easy to quilt, and to show off the machine quilting, but it lacked a bit in the area of sturdy construction details. 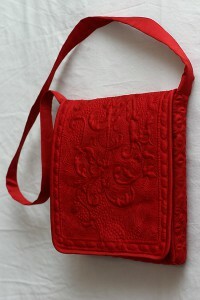 I discovered Lisa Lam’s website and blog, and learned the finer points of bag construction from her books and patterns. I made a bag based on one of her patterns to carry an iPad, and then I had lots of fun (and spent lots of time…..) making a ‘fancy’ bag that I love to carry. Then I put all that I had learned together…. Stay tuned for the rest of the Machine Quilted Bag story! It has been too long since I have written! I used many different colors of silk thread to make the silver silk sateen top look iridescent, especially in the densely quilted area outside the feather border. 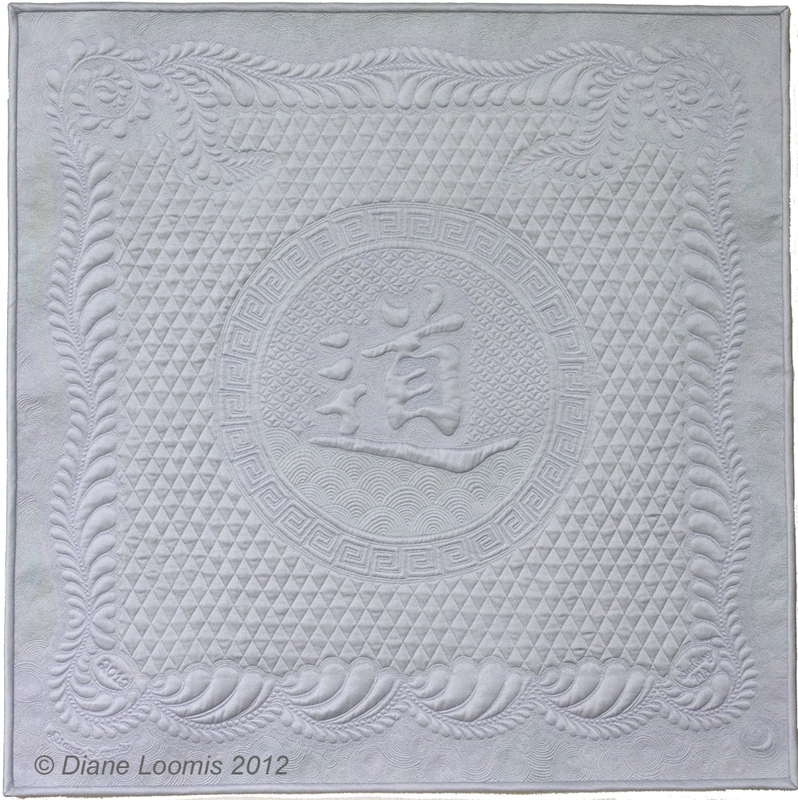 I used trapunto in the center chinese character, ‘tao’ (meaning the path, or the way) and in the feather border. I’ll post some more photos soon! I always get so excited when I finish a project. (That’s why small projects are so fun!) I finished the small bag for my niece – I am really pleased with the way it turned out. 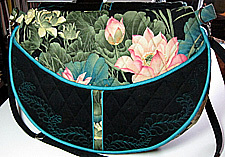 The bag is made of solid cotton sateen, layered with wool batting, and quilted with silk thread. I used a fun printed fabric for the back (which you see when you open the bag) and also in the braided strap and fabric button / tassle. I spent the longest time trying to decide how to complete the bag with some type of closure. I wanted the top flap to stay down, and I needed something easy – no buttons or toggles or things to fuss with – Julia is just 7 years old, after all! And I just couldn’t bring myself to sew a magnet (or anything else … velcro? ) under the flap. So I made a fabric button (of sorts) and tassle, and the weight of it keeps the top flap from flying open. Perfect for a little girl I think. Although my daughter watched me making the bag, it wasn’t until it was finished and she realized what I was making that she became interested in it. After I explained that it was for her cousin, I asked her if she would like one. (What kind of question was that?) Of course she would like one! What color? hmm … the usual color, of course … pink. My brother and his daughter visited from Singapore last month. I hadn’t seen my 7 year old niece in over 5 years, and we had a great time during their stay with us. My niece’s birthday is at the end of August, so I thought I would make her a small bag. I adapted a feather I designed for one of my classes, and used a stencil for the flower. Unfortunately I wasn’t able to finish it before she left, but its getting close. I am experimenting with the bias strips to make the handle/strap for the bag.